When strawberry season hits, it’s time to whip up a magnificent berry treat. 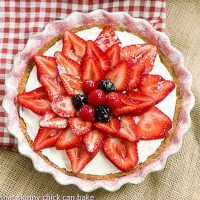 This Strawberry Cream Cheese Dessert starts with a graham cracker crust, followed by a sweet, creamy filling and finally crowned with fresh, juicy strawberries! I have been counting the days till local strawberries appear at the fruit stand down the road. Tiny and flavorful, my kids also anxiously await those succulent berries that are available just one week a year. Hoping they will be ripe at the end of May, we are usually disappointed when we have to wait until June to enjoy the best strawberry shortcakes of the year…when these local berries are picked at the peak of their sweetness. But thankfully, the California berries at the market were red and fragrant…and perfect to top this Strawberry Cream Cheese Dessert. 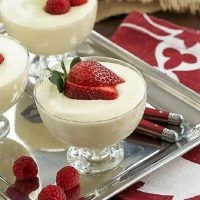 Make sure to check out all the magnificent berry recipes at the end of this post. 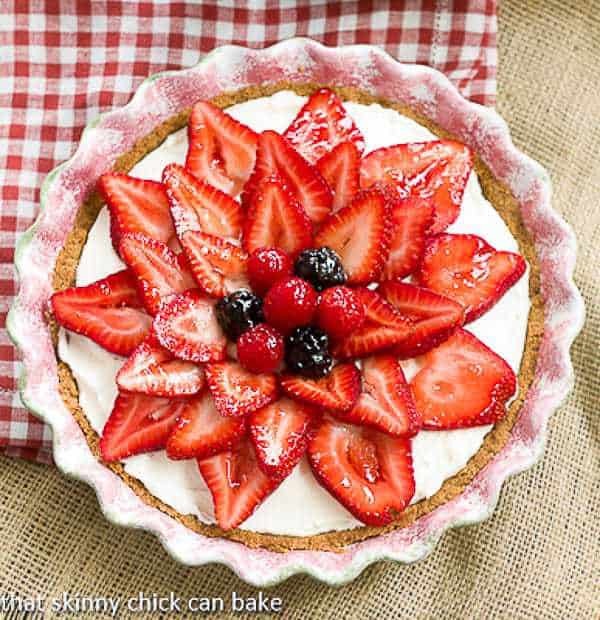 A graham cracker crust was paired with a creamy cheesecake-like filling, then finished off with a sunburst of berries. Melted currant jelly is the perfect glaze for strawberries…it helps magnify their scarlet hue, providing an enticing gloss and subtle flavor. The guys skipped dessert when dining out last night…after asking if there were two slices of pie left at home. I’d say that’s a positive endorsement. Combine graham cracker crumbs and sugar. Mix in melted butter. Press into 9-inch pie plate. Bake for 13-15 minutes. Cool completely. When the crust is cool, whip together cream cheese, sugar, and lemon juice. Set aside. In another bowl, whip cream to soft peaks. Combine the whipped cream with the cream cheese mixture. Fill pie crust and chill for at least an hour. Slice berries, reserving outer slices for another use. Arrange as desired over the top of the filling. Add other berries to center, if desired. Brush with melted currant jelly. This is such a gorgeous tart. Perfect for this strawberry season and I can’t wait to make it for my kids. They love strawberries. Liz, there is that beuatiful looking pie that we saw on your facebook page the other day – it looks fabulous and I love the ingredients, graham cracker crust, cream cheese filling and fresh seasonal strawberries – I bought a bautiful pie dish the other day for “strawberry pie”, I will make this pie for sure and try to make it look as close to your original as possible, I will be hit – I wiill let you know (with pictures) how it turns out! I love this theme. Yes, I too am impatient waiting for the local berries to come. Strawberries are so fast. Good thing I can enjoy the blueberries a bit longer. Lovely dessert as always. I’d skip restaurant dessert if I knew your strawberry marvel was at home, too. Your Strawberry Cream Cheese Pie is pure perfection, as always. As an uber strawberry lover, I have to make this one. I have a new pie plate, so I’ll be trying this gorgeous dessert soon. I bow to the greatness of your ability to slice, arrange, and decorate your fruit desserts. So beautiful Liz! Beautiful! Looking at this make me want to buy some strawberries. Mmm I could probably eat this entire dessert! Cheesecake like with strawberries is my favorite. So pretty and delicious. I need some strawberries in my life! t think I could control myself and I would eat the whole thing! Beautiful! Love you pretty presentation!! 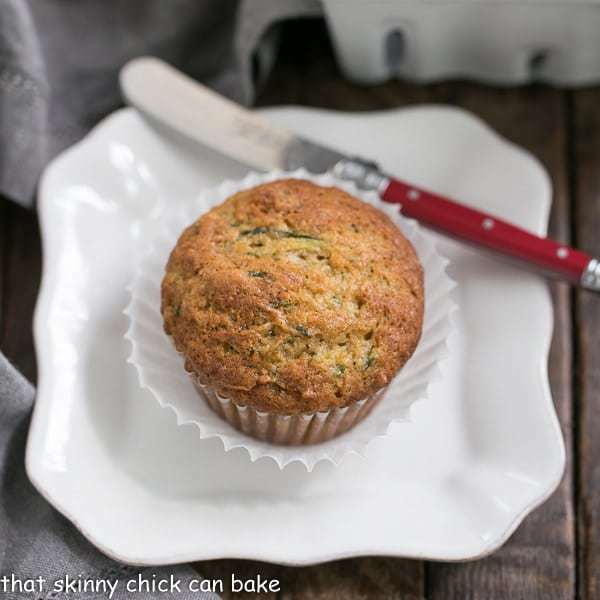 You´re so in your element with this recipe Liz! 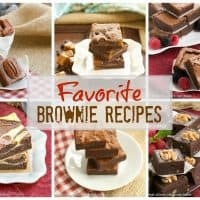 Love the idea of this type of desserts for summer. Beautiful presentation! Liz you are the berry queen! ^.^ I can imagine that you have been waiting impatiently for the strawberry season to begin and look what you came up with. I am all smitten! The California berries have been pretty good this year. We’re just starting to see local berries now. Great job with this terrific looking dessert! Thanks so much. Beautiful! 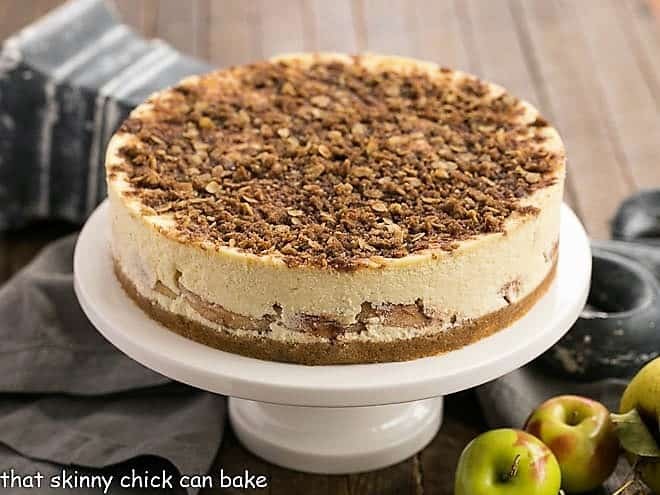 And anything cheesecake-like, well, I’m there! Wow, that is endorsement when the guys skip dessert out in favor of a homemade one! 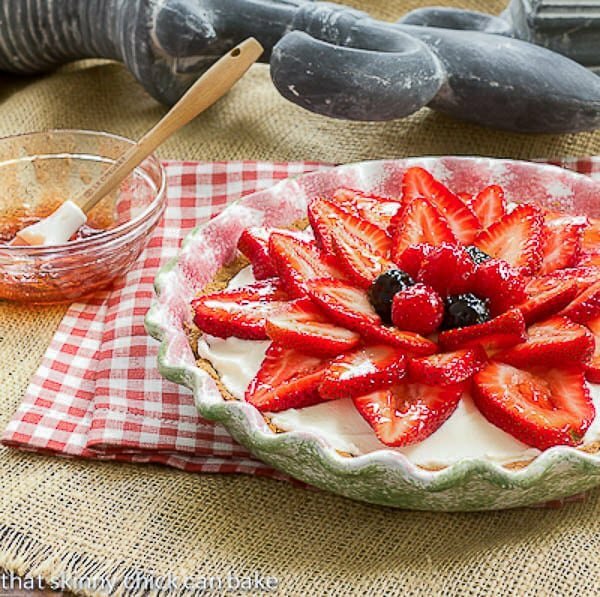 This looks incredible… beautiful photos as usual, and I love that pie dish! Simple lovely!!! I love this variation! I just made a cream cheese/strawberry dessert with strawberry jello on top, but I love the use of jam in this recipe. And your presentation is absolutely gorgeous. To beautiful to eat. 😀 love it. I want a huge slice! 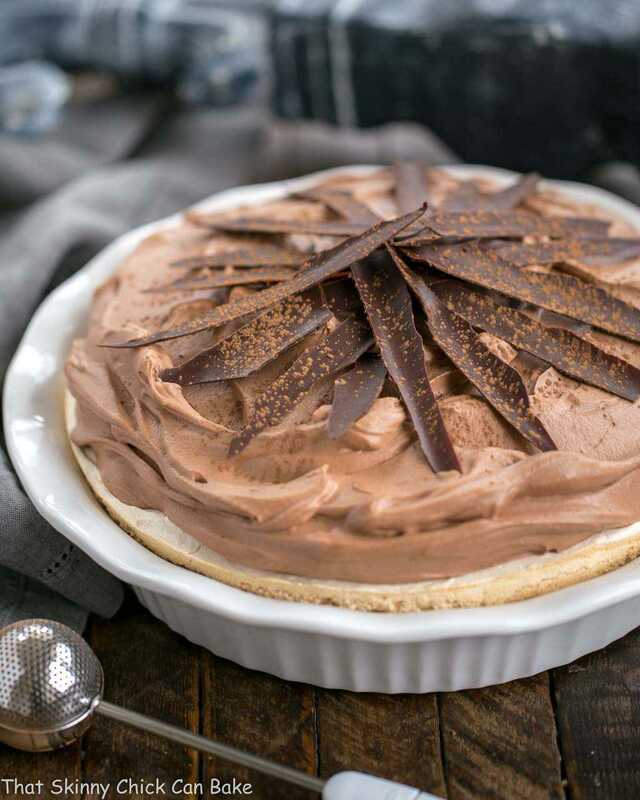 That looks perfect and sound delicious – I can understand why the guys would skip dessert to come home to that pie! This sounds so delicious, and looks fantastic! I love the fan of strawberries on top. So beautiful! I posted a strawberry recipe today too. For me, they’re one of the first signs of summer! 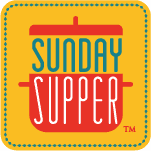 I am always excited to come here and see what gorgeous recipe you have created!! Love it!! You have the steadiest hands on the planet. Beautiful dessert! Strawberries and cream cheese are one of life’s great combos… I’m hungry! I’m always so impressed by your desserts! So pretty and creative! This is so beautiful, Liz. Strawberries and cream cheese make a perfect combo in this summer dessert. I love anything in a graham cracker crust. And this looks worth loving! I would say it is too pretty to eat–then I would enjoy a big slice! Yummy. Liz, I swoon! Everything about this is beautiful, from your gorgeous photos, to that adorable pie plate (I want!) to your luscious, creamy, berry-filled dessert. Such a pretty dessert for strawberry season! Such a pretty dessert. I just want to reach in and grab a slice! You captured this tart just beautifully. Everything pops! Have a great week Liz! Liz, I’m in awe of your wonderful strawberry presentation here. Absolutely beautiful! I can totally relate because I’ve also been counting down to berry season. We do get the California berries all year long but it’s not the same as the in-season NY/Hudson Valley berries and I think we’re going to go berry picking in the next couple of weeks now that the U-Pick farms are starting to open. I have lots of these berry/cheesecake desserts that I regularly make although you take the prize for decorating, Liz! 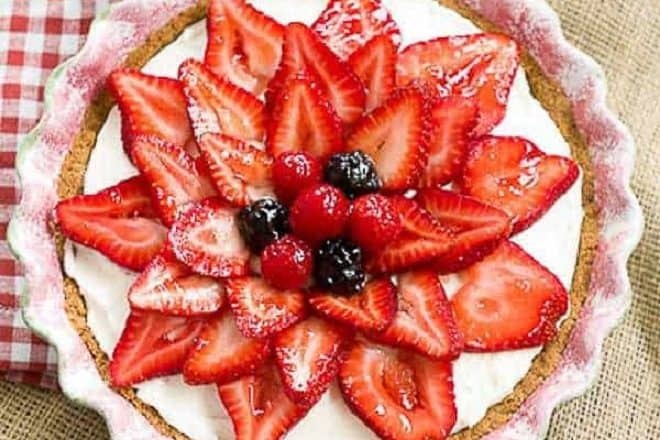 Wow, this strawberry tart looks gorgeous! Love how the red currant jelly makes the strawberries pop out even more. Perfect presentation and looks delicious Liz! Beautiful dear Lizzy, have a lovely week!! Yum… I love the cream cheese and strawberry combo. This dessert is so pretty and I love the colors. This is GORGEOUS!! It’s like two desserts in one, I love it! What a beauty! At first I thought it was a strawberry tart. It sounds very original and you reminded me I must make a strawberry tart. I love a baked cheese cake and the strawberry topping on this just pushes it over the edge and you’ve arranged them so beautifully Liz, you are really a master at this. Strawberries are still some time away for us, and we’ve gotten a bit of a cold front today, I wore gloves cycling into work this morning. That tart is gorgeous. I’ll bet it travels well too, even if you had to “strawberry” it after you got there. Your tart looks like a flower, so beautiful. I wish I had the eye to create such a lovely picture. Your strawberry top looks so pretty! 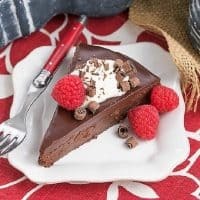 This is a perfect summer dessert! I do miss living in Oxnard for the strawberries season, especially the festival. There is something about fresh local strawberries. Thankfully there is a strawberry farm not that far away from us and British strawberries are good. But there is something perfect about California strawberries that I do miss. By the way yet again you have made not only a delicious dessert but it is so beautifully presented. I love fresh berries! I just eat them straight from the carton! you can’t beat that fresh flavor! This dessert though? might just top the tasty berries! I would love this! I like the idea of brushing it with jelly. So elegant! I also LOVE berry season and going to the Farmer’s Markets or U-pick farms. . dude, this pie. . O.M.G. Looks sooooooo good! love!! I love your beautiful artwork on the pie. Strawberries are pretty on their own but you made them look spectacular! Happy Father’s Day to Bill, have a great weekend!